Xscape is a female American R&B quartet that had a string of hit songs during the early and mid 1990s. The original lineup of the group consisted of sisters LaTocha Scott ("Meatball") (born October 2, 1973) and Tamika Scott ("Juicy") (born November 19, 1975), along with Kandi Burruss (born May 17, 1976) and Tameka Cottle ("Tiny") (born July 14,1975). The Scott sisters' father, Rev. Randolf Scott, was part of the 1970s R&B group Scott Three. The Scott sisters' father, Rev. Randolf Scott, was part of the 1970s R&B group Scott Three. The sisters sang at church throughout their childhoods while being trained by their father. In 1990, they met the other two members, Burruss and Cottle, in College Park, Georgia, a suburb of Atlanta. They first sang at Jermaine Dupri's birthday party in 1991 and later signed to his label, So So Def Recordings. They released their debut album, Hummin' Comin' At 'Cha, in October of 1993. The album featured their debut single, "Just Kickin' It", which reached #2 on the U.S. Billboard Hot 100 singles chart, along with the other singles "Tonight", "Understanding", and "Love On My Mind". Xscape's sophomore album, Off the Hook, was released in July of 1995. It featured the #1 hit "Who Can I Run To" (a cover of the song originally recorded by The Jones Girls) along with singles "Feels So Good", "Can't Hang", and "Do You Want To". During the next few years, they collaborated with different artists such as female rapper MC Lyte on the song "Keep On Keepin' On" and pop/R&B singer Mariah Carey on the Mr. Dupri Mix of her #1 song, "Always Be My Baby", which also featured rapper Da Brat. They released their third album, Traces of My Lipstick, in May of 1998. It featured the singles "The Arms Of The One Who Loves You", "My Little Secret", "Am I Dreamin'", and "Softest Place on Earth". After the release of this album, the group parted ways. 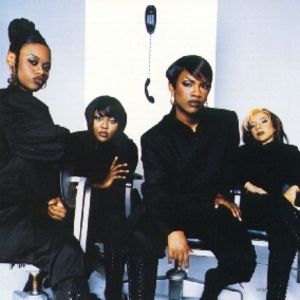 Then after a five year hiatus Xscape returned to the radio airwaves. With three platinum albums and a slew of top 40 singles under their belt, the sultry R&B quartet, Xscape, is ready to release yet another spicy, seductive album, currently entitled Unchained. Sisters LaTocha and Tamika Scott have reunited with Tameka ?Tiny? Cottle, and have added a new member, Keisha Miles, to round out their signature sound. Xscape has been busy booking live performances across the nation following the growing success of ?What's Up?, the first single off the new album. The group recently opened for Alicia Keys in Houston and just performed on 100.3 The Beat's 15th Anniversary Birthday Bash at the Universal Amphitheater.